I’ve never been a huge fan of pork. I don’t mean to throw Mom under the bus, but growing up, I always dreaded having it for dinner. That said, I know conventional wisdom suggested that you cook pork well done, so I can’t blame her. After I moved out on my own, I never really cooked pork. Even to this day, it’s not something I ever order at a restaurant. Exceptions? A really good Cuban sandwich…and bacon, of course! After moving in with Evan, he would suggest pork chops from time to time. He’s made some really amazing meals like pork chops stuffed with cranberry/apple stuffing. 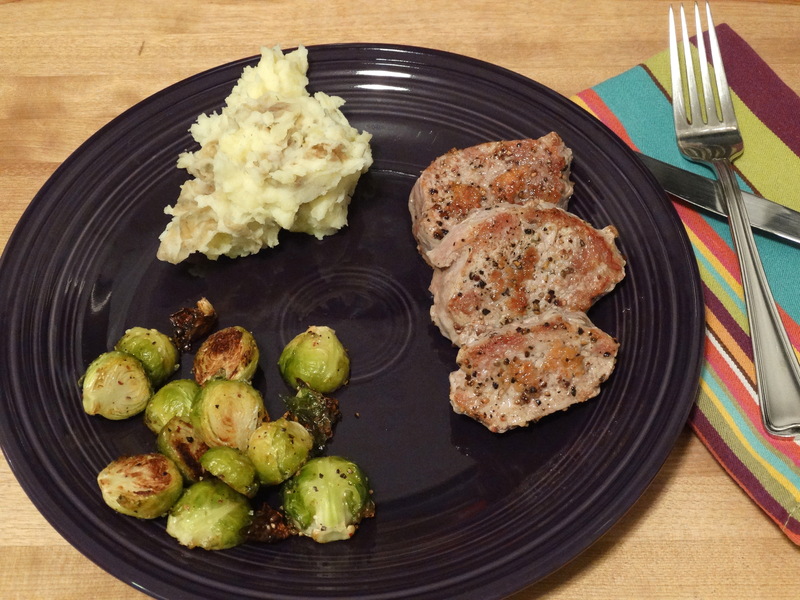 Thanks to Pinterest, I’ve dabbled in a few pork loin recipes, but my new favorite way to enjoy pork is simple and quick – perfect for weeknights! On a side note, we refer to pork loin in our house as “pork lion.” A few years ago we were out to dinner and pork loin was featured on the specials menu, but loin was misspelled “lion.” Now, I’m certain that the pork “lion” will always exist in our household. 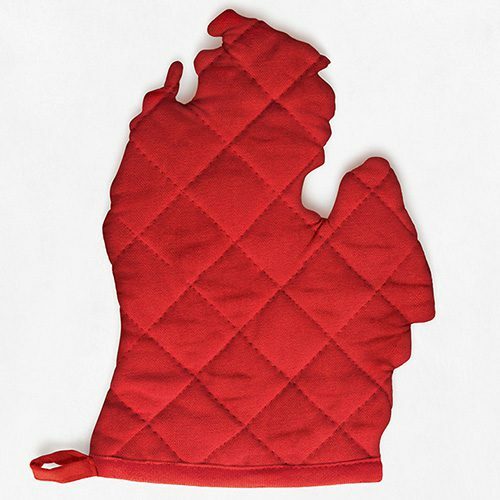 Start by heating a non-stick skillet over medium-high heat. 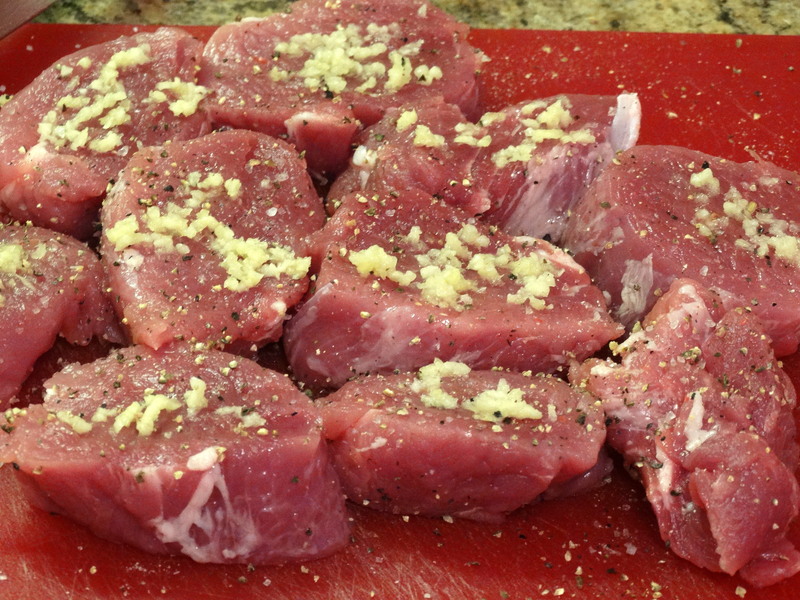 Trim any excess fat off a one pound pork loin and slice into one inch thick medallions. We got 8 good sized pieces and 2 smaller ones out of our pork loin. 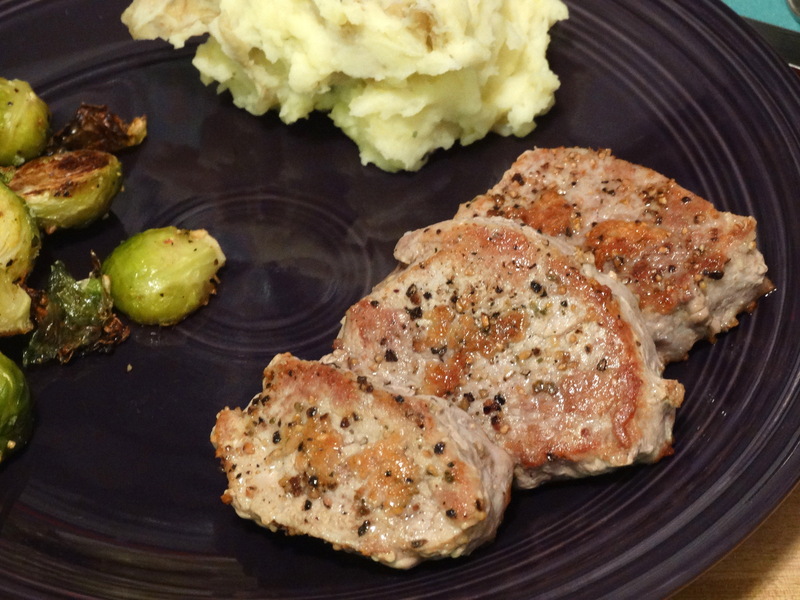 Generously season both sides of each pork medallion with coarse salt, fresh ground black pepper, and minced (or pressed) fresh garlic. Add about 1 tablespoon of oil to your pan. I used coconut oil, but olive or canola work as well. 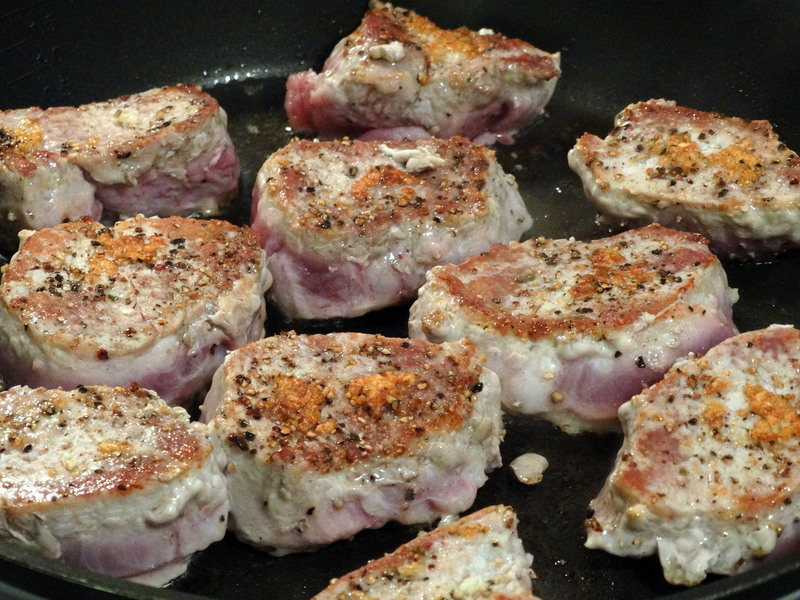 When your pan is screaming hot, add the pork medallions and reduce the heat to medium. Cook for 5 minutes on each side, flipping only once. Turn off the heat and let the pork rest for 5 minutes before serving. How easy was that? 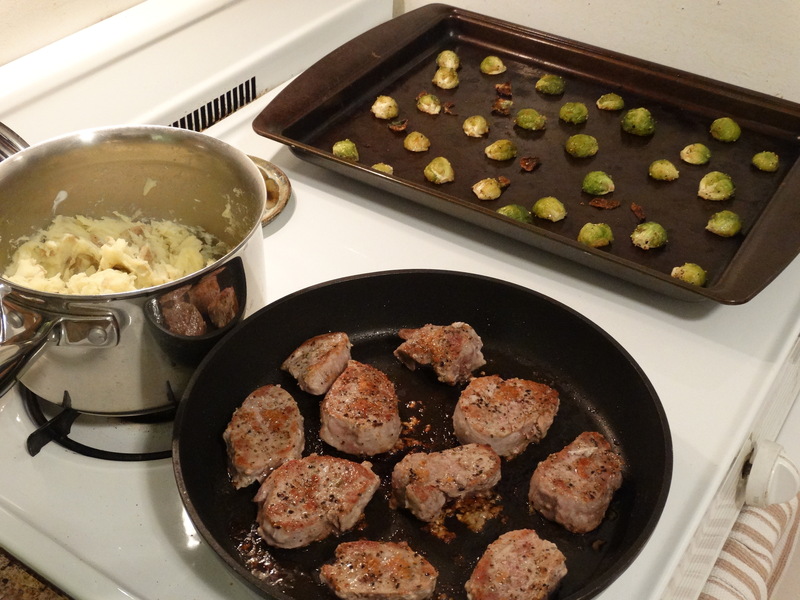 We had mashed potatoes and roasted Brussels sprouts on the side. Brussels sprouts are a yummy side dish for lots of great meals. Not sure how? Preheat the oven to 375 degrees. Rinse them off to remove any dirt, trim the stems, and remove the outer layer of leaves if they are damaged. Cut each sprout in half, then toss with just enough olive oil to coat evenly, along with coarse salt and fresh ground black pepper. Spread the sprouts out on a baking sheet, cut side down. (If some of the leaves come off during the tossing process keep those and roast them too! They are a crunchy, tasty treat.) Bake for 15-20 minutes or until tender. Whatever sides you decide to pair up with your pork “lion” (ROOAAARRRRR! ), enjoy! 1) Heat a non-stick skillet over medium-high heat. 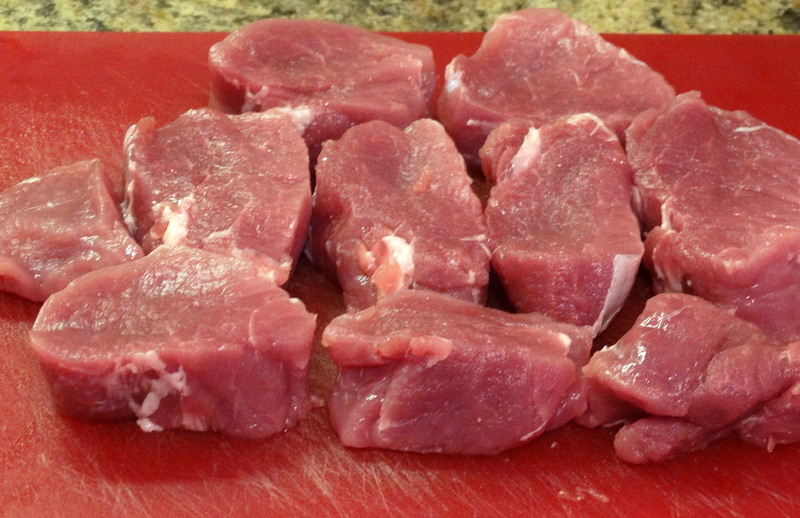 Trim any excess fat off a one pound pork loin and cut the loin into one inch think medallions. Generously season both sides of each piece of pork with coarse salt, fresh ground black pepper, and minced (or pressed) fresh garlic. 2) Add 1 tablespoon of oil to your pan. 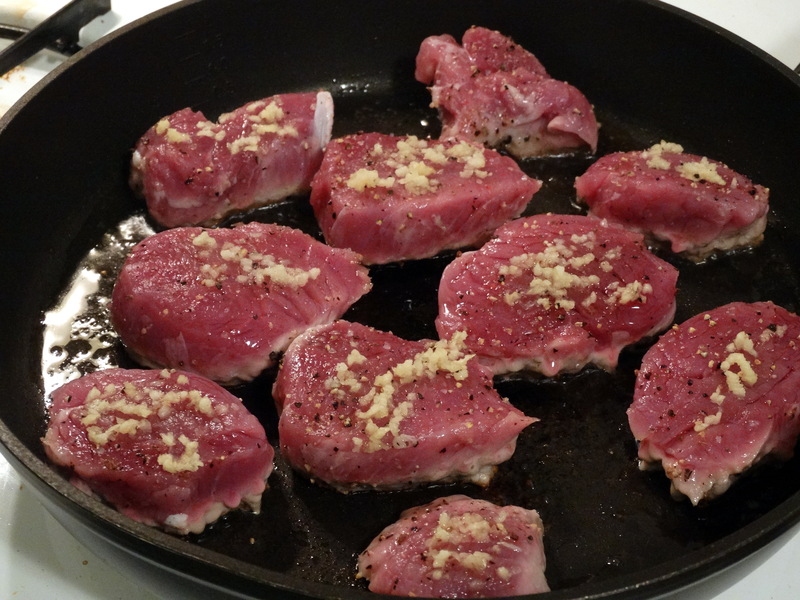 When your pan is screaming hot, add the pork medallions and reduce heat to medium. Cook for 5 minutes on each side, flipping only once. Turn off the heat and let rest for 5 minutes before serving. Preheat the oven to 350 degrees. Rinse the sprouts to remove any dirt, trim the stems, and remove the outer layer of leaves if they are damaged. Cut each sprout in half, then toss with just enough olive oil to coat evenly, along with coarse salt and fresh ground black pepper. 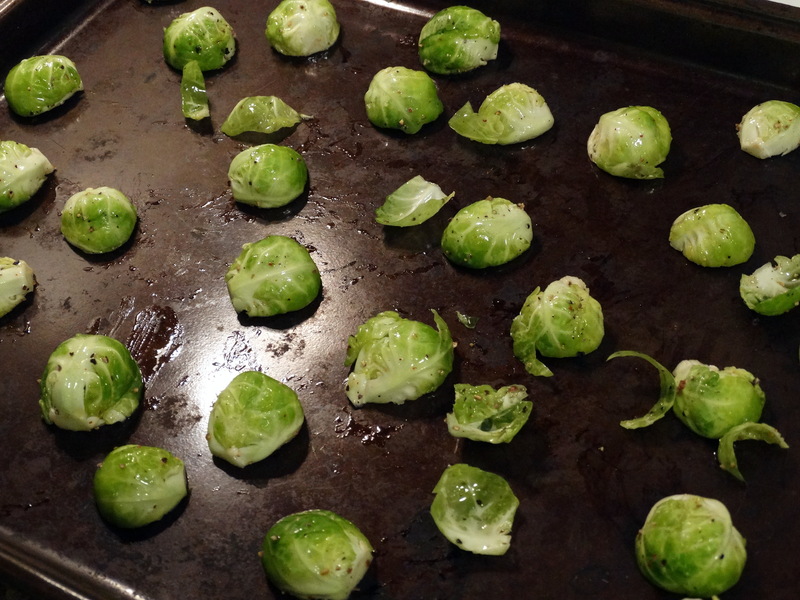 Spread the sprouts out on a baking sheet, cut side down. Bake for 15-20 minutes or until tender.